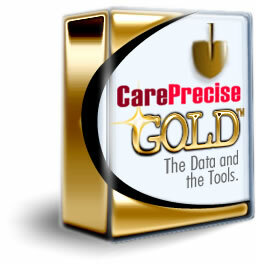 CarePrecise Gold is one of the most powerful medical marketing tools available, complete with basic data on the nation's 5.8 million physicians, dentists, clinics, hospitals and every other type of healthcare provider, plus easy-to-use software for creating tightly targeted mailing, phone and fax lists of healthcare providers who match your criteria. No dealing with list brokers, no "single use" rules1, just clean, accurate addresses, phones, fax numbers, and rich information about your prospects. Longer subscription plans are available with substantial savings. 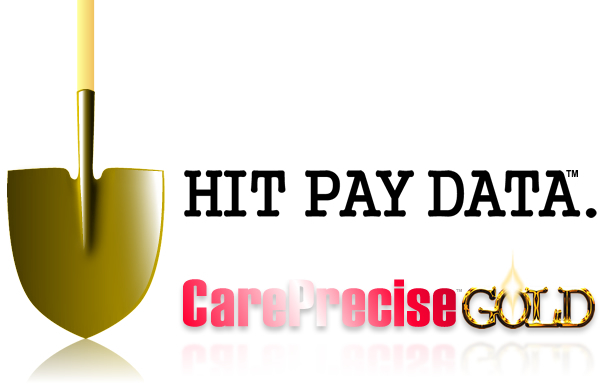 CarePrecise Gold pricing includes the full CarePrecise Access Complete database. Another version, CarePrecise Hub, is available for organizations who need the data available in their multiple locations. Please call us for information. Need even deeper information on providers, practice groups and hospitals? Take a look at CarePrecise Platinum. CarePrecise Gold puts the complete 5.8 million member U.S. healthcare provider community and our powerful targeting software together. Whether you're creating a tightly targeted medical marketing campaign, planning healthcare research, or developing a clinical trial provider pool, CarePrecise Gold is the tool of choice, from the most respected name in healthcare provider data. The wizard-like, step-by-step software gives you easy control of the largest commercially available database of U.S. healthcare providers. There's never a list rental fee. We send you ALL the data on America's 5.8 million healthcare providers, yours to use forever, and tools to build your own tightly targeted lists. More than 200 classifications of physicians, more than 20 classifications of hospitals and clinics, and hundreds of other types of healthcare providers, complete with addresses, phones, fax numbers, credentials, licenses and much more. With Gold you get all 5.8 million US healthcare provider records, and powerful software to find exactly the ones you want. More than 800 specialties, subspecialties and facility types in all. Don't know the codes? No problem: CP ListMaker now includes a Specialty Search tool that lets you search in plain English. By Zip Code®, cities, counties, states, even geographic radius in miles from a central location, using the integrated Geo Radius tool. Want to tighten up your list using wealth data? Gold can do it for you. Gold can help you find physicians serving higher income areas, or locate hospitals serving economically disadvantaged areas. Select by Urban/Rural/Other status. Need telemedicine prospects? Gold can instantly give you a list of hospitals, ambulatory healthcare facilities and other providers in rural areas. Find providers in large metro areas, or in smaller cities. CarePrecise datasets include a co-location code table (tCoLoCode). The CoLoCode is an algorithmic derivation from provider practice data, which facilitates querying providers by practice location. Our QoRelate™ record linking system standardizes and conforms location data far beyond postal specifications to link providers practicing together. These data can be used together to successfully identify physician groups and all of their specialties, and the CoLoCode data can be used to identify any provider type in a co-located group practice, including dentists, optometrists, radiologists, etc. The CoLoCodes can also be used to identify physicians and others working within large health systems, universities and other institutions. You can select by size of the medical practice or organization (number of co-located providers, by selecting a range (i.e., between 5 and 50 providers). Example Application: The co-location codes let you find large (or small) clinics, based on the Count field, which shows the number of providers in the database with the same practice location. For instance, while the code UICFLG70MMPNPNHRR seems meaningless, it happens to be a CoLoCode for the Cleveland Clinic in , and it can instantly filter the database to show you all of the 2700+ providers practicing at the Cleveland Clinic's 9500 Euclid Avenue site. We also provide new practice group identifiers from CMS that indicate providers who have reported status as a multi-specialty or single-specialty group. Need to find new providers, or providers who have just moved to a new location? Gold's filtering features make it easy to find who's just hung out their shingle, and who has just updated their address, phone or other practice information. Gold helps you find sales opportunities. Select by provider type (individual/organization) and Gender. Know who you're talking to. All CarePrecise organization records have a contact name, full mailing address and phone number. You can select only those individual providers eligible to bill Medicare with the PECOS filter. Save criteria scenarios and targeted lists for re-use. In CP ListMaker you can name and save your criteria for comparison and tweaking. Keep lists of providers you've targeted. ...or the casual salutation Kevin, based on your preference. Practice or Business Mailing Address... Choose which address to send to, the provider's actual practice location, or the business mailing address. Products with SharpMail's abilities alone are sold for hundreds of dollars (we ourselves used to sell them for $1,200), but now we package them for free within CP ListMaker. Customize the standard output. Using the Clone feature, start with a standard output style, then add or remove fields to get exactly the data you need. Easily add practice group indicators, counties, 9-digit and 5-digit zip codes, and much more using Clone customization. Unlimited export. Unlike "locked" databases or one-time-use mailing lists from other vendors, CarePrecise Gold allows you unlimited exports. Use the automated export buttons, or use the export functionality in Microsoft Access, with complete access to all the data, to get exactly what you want. Open Source Code. Gold is built in Microsoft Access and is completely open source. Every feature, including powerful SharpMail genderization and proper casing features - are available for your use. User-accessible Access functions make them easy to use and to extend to your particular needs. No technical skills required. The wizard-driven interface carries you through building your lists with ease. For the advanced user, CP ListMaker is built within Microsoft Access, and all functionality is open and available for customization. DELIVERY: Customers receive a link via email to download files. Shipping on disk is also available. SYSTEM REQUIREMENTS: The CP ListMaker tools included with CarePrecise Gold require Microsoft Access 2007 or later, running in Windows XP, Vista, 7/8/10. LICENSING: Buyer is licensed to use CP ListMaker software in any way desired as long as it is within and for the buyer's own organization and is used by only one user at a time (may not be installed on multiple computers for use by multiple simultaneous users). The CarePrecise Access database carries a separate license, and is also limited to use within the buyer's own organization and to only one user at a time (may not be installed on multiple computers for use by multiple simultaneous users). Additional licensing options are available for uses that involve distribution of the data or use of the data by more than one user. Find complete details about the CarePrecise Access Complete data here. 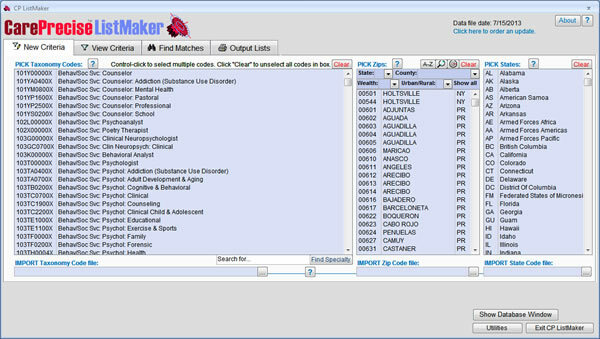 Explore the power of the CP ListMaker software here. View a product comparison chart here. 1. License information: Pricing shown is for single-user/single computer installation. There is no limit on the number of times you may use the data, but you must have special licensing to share it with others. Site licensing is available at an additional price; master licensing for use on websites or other publication or use in derivative products is also available. Review our licensing options. *	Subscription plans include the listed release schedule for the listed time period, with releases approximately monthly or approximately quarterly as indicated. Each release is based on the most recent dissemination from the data sources currently available at the time of the release.